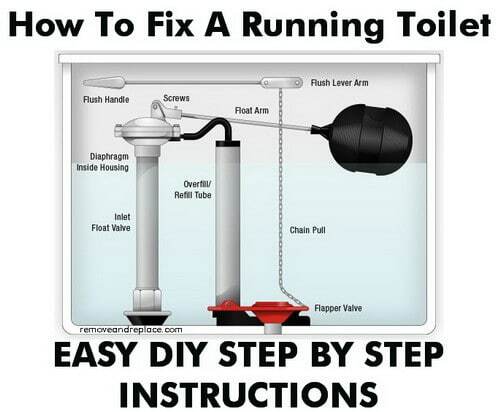 Fixing a constantly running toilet is something everyone needs to know how to do themselves. This DIY toilet repair guide will show you the things you need to check yourself to avoid calling a plumber. The inner workings of a toilet are quite simple and you don’t have to be a maintenance person to troubleshoot and repair these problems yourself. The most common issue of a faulty toilet is that the toilet is constantly “running”. Basically this means that the water coming into the toilet tank will not shut off. 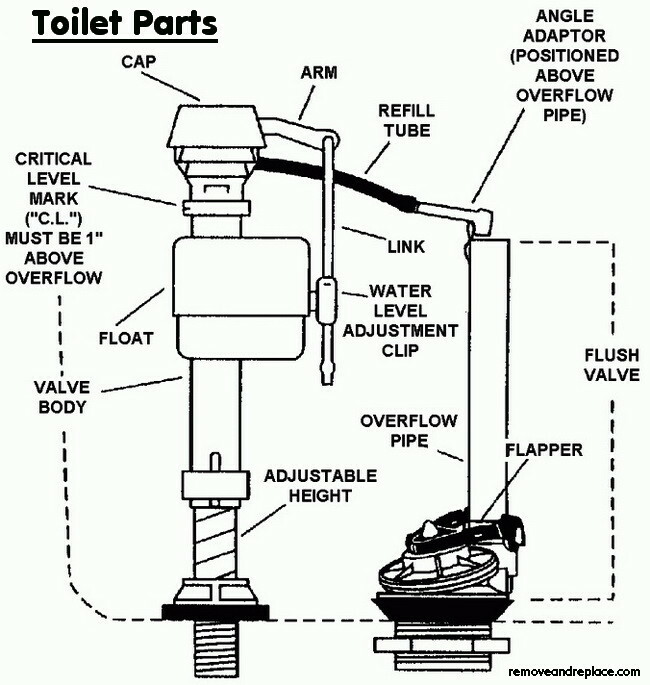 The most common reason for this to happen is the toilet flapper (aka flush valve) is worn out and is not “seating” correctly on the bottom of the toilet tank. When the flapper does not sit correctly or has become deformed, the water will not be able to fill the toilet tank and the water will constantly be flowing and will never finish filling the bowl. When this happens, the easiest and fastest way to fix this issue is to replace the toilet flapper. This valve will cost you from $3 to $7 dollars depending on where you purchase it. It should take only 5 minutes to install yourself and you do not need to turn the water off or take the toilet apart. Since this is the most common toilet fault, we will explain how to remove and replace this yourself below. WHERE IS IT AND WHAT DOES IT DO? – Your toilets flapper valve is located in the bottom of the tank where the water is stored. The purpose of the flapper is to seal the tanks drain hole until the handle is once again pressed. When you flush the toilet it pulls the handle to the flapper valve upward and releases the stored water into the toilet bowl. If the flapper is damaged, has algae build up, is warped or worn, it should be cleaned or replaced. A bad or worn flapper will result in the toilet constantly running, refilling or making dripping and running water sounds. HOW DO I EASILY REPLACE THE FLAPPER ON MY TOILET? – First, remove the toilet tank lid on the rear of the toilet. NOTE: This next step is optional if you do not mind getting your hands wet in CLEAN water. If you must have the driest hands possible, then turn off the water valve against the wall and located under the toilet tank. NOTE: The reason we suggest to NOT turn the water valve off is because 9 times out of 10 this valve will snap and cause you to replace this valve also. So if you DID turn the water valve off then flush the toilet to drain out the water from the tank…. 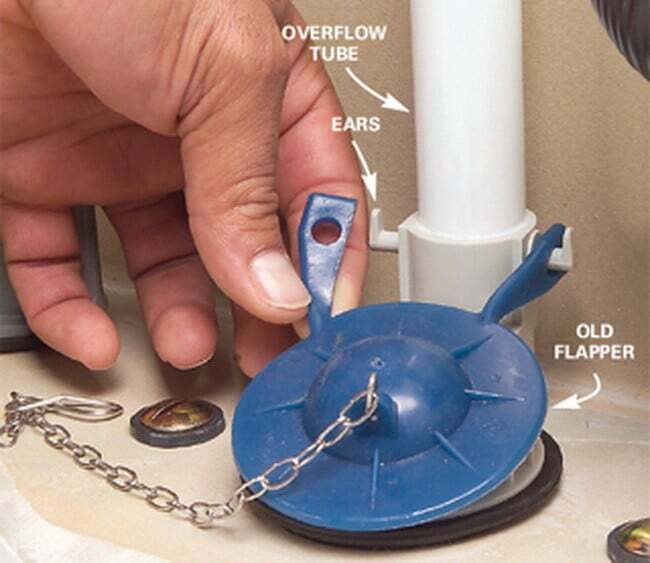 The rubber flapper valve is at the bottom middle area of the tank and is connected to the flushing handle by a plastic or metal chain. Next put your hands in the toilet tank and check to see if the flapper is damaged or worn out and causing the leakage. Clean the flapper and drain hole with a rag removing any build-up of algae and make sure the areas are smooth and clean. If the problem was just a build-up of algae or similar, clean and put back in place. Test the toilet and if the problem is gone, you are done. If the flapper and drain cannot be cleaned and the flapper is damaged or warped, then the flapper should be replaced. Usually replacing just the flapper will do the trick but in some cases the flapper AND the drain seat must be removed and replaced. 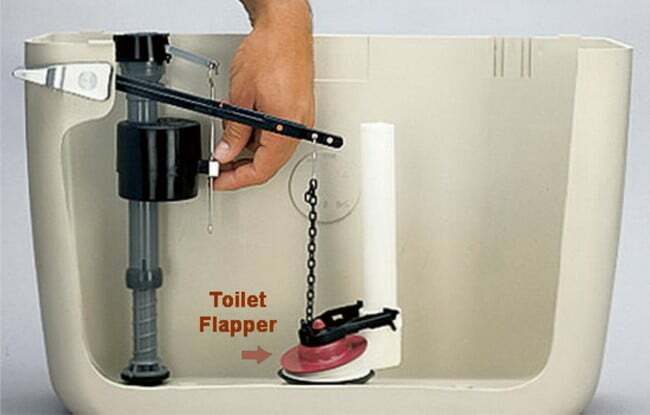 The flapper is easily replaced by purchasing a universal replacement and installing it in your toilet. Sometimes flapper’s vary and you will have to cut the sides to fit into your toilet. Take a look at the old flapper and make sure they are similar. Then install it in the toilet. Once you install the new flapper, turn the water valve back on if you turned it off and FLUSH the toilet. If the toilet flushes, fills, and the water turns off, then SUCCESS you are finished fixing your toilet. If the same problem persists then have a look in the toilet tank when you flush to determine what the fault is. NOTE: A toilet flapper valve can look slightly different as they are made universally and can vary in color and sometimes shape. See below for different types and what exactly you are looking for when doing this repair yourself. As you can see in the pictures below, one type has a plastic chain and the other has a metal chain. Also, one is a brownish red and the other is a blue. Please note that you do not have to get the EXACT flapper as before, most any will work as they are all universal. Wal-Mart, The Home Depot, Lowe’s and Ace Hardware all sell universal flapper valves. THE EASIEST WAY IS TO REMOVE YOUR OLD FLAPPER AND TAKE IT TO THE STORE TO MATCH IT UP. This way you will not come home with the wrong piece to fix your toilet. Also, if you have suggestions to make this job or troubleshooting even easier, please leave a comment below. Remove and Replace the old toilet flapper valve as shown above. Where are the dads and husbands when toilets run all night…. DIY of course! !